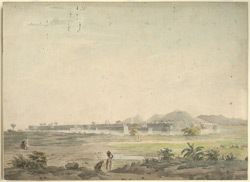 Water-colour painting of a walled town in south India (probably Mysore), attributed to Sir Alexander Allan, 1st Baronet (1764-1820), dated circa 1790. This is one of five drawings of towns and hill forts in south India probably made during the third Mysore War. They were originally in the collection of Sir Gore Ouseley (in India 1788-1805). Mysore is situated in a valley in Karnataka, southern India. It was the political capital of the Wodeyars and under their patronage was embellished with many fine palaces, temples and gardens. In 1793 Mysore was levelled by Tipu Sultan in order to accommodate his new city. The British occupied the city after their defeat of Tipu Sultan in 1799 and installed Prince Krishnaraja Wodeyar (III) on the throne of his ancestors.